What Kind of Sewing Day Are You Having? 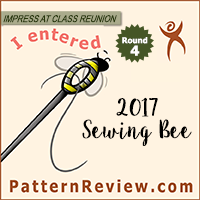 The trials and tribulations of trying to get my latest sewing project done in time for a Pattern Review Contest have inspired this little quiz. 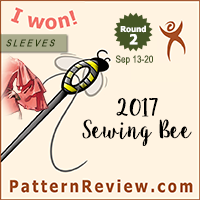 Have fun, and let me know what kind of sewing day you are having in the comments! a. Sew it in perfectly on the first try. Because you have done this so many times you could do it in your sleep. It only takes you a few minutes. And the only reason you used the instructions was so you could give them an accurate analysis on Pattern Review. b. Sew it in without much trouble, since you have done this before, through you did stare at the instructions for a long time, you pulled out two reference books, and the internet. It took you an hour to figure it out, but you got it. c. You had a little bit of trouble and had to rip it out and sew it in again. It isn’t perfect, but it is pretty close, and you can live with the results. d. You realize too late that you weren’t supposed to sew that side of the collar, because that side of the collar gets sewn in the facing to make the notch. You have to rip up most of your collar. Where you already trimmed the seam allowances. Which means when you actually do get your collar looking right you now have something of a gaping hole on the under collar. Which you have no option but to tack by hand when you get around to it. a. Already planned and sewed bound buttonholes. And you didn’t even need instructions because you eat couture finishes for breakfast. b. Measure where the buttons would go on the underlap and position your buttonhole perfectly. c. Think about it and realize you don’t really need operational buttonholes because the vents are just for show anyway and thus just sew on the button as decoration. d. Place the buttonhole where the pattern indicates. You need to stitch the buttonhole twice because your fabric is so thick it accidentally triggered the automatic button hole sensor to switch directions at the wrong time. You then realize said buttonhole doesn’t actually cover the underlap, so it can’t actually be functional. You now regret actually poking the buttonhole opening into your sleeve, but figure you can cover it up with the button anyway, so who is going to really know? a. One try. Because you are a sewing goddess and/or god. b. Two tries on each sleeve because the fabric is thicker and stiffer than is strictly desirable, so you have a tiny bit of trouble. c. Three-five tries. You get it eventually though and it looks fantastic. d. The number of licks it takes for a toothless baby to get to the center of a Tootsie Pop is smaller than the number of times you had to rip out those friggin’ sleeves. And they still aren’t perfect. And the fabric didn’t recover well from the mistakes. And you just don’t care anymore. a. Never start a project without everything you could possibly need at hand. So you obviously stocked up on the thread color before you cut out your fabric. b. Realized you were going to run out before you actually did run out, and thusly were able to get more thread at the store. Hey, look, you even have a coupon for thread! c. Run out of thread, but at a non-critical junction. You were going to run to the store tomorrow anyway. And you can always move on to the lining for now. d. You run out in the middle of a button hole. And so you go to the store. They are also out of said color of thread. You go to another store. They have the thread, but you realize you left your coupon at home. a. Had this idea originally and thus had everything ready to go when you were cutting out your jacket. b. Have everything you could possibly need in your stash. It takes a while to locate what you need, but you eventually find it all. c. Don’t have any piping cord or any fabric in the color you need. You head to the local craft store. They don’t have the exact size of cord you wanted, but you find something close. You also find the a perfect coordinating fabric that is on sale at 50% off. There is only one person ahead of you at the cut counter. d. You head to the store. The selection of cording is abysmal because all of the people sewing Halloween costumes have picked over the trim section, and the home dec area is no help. Eventually you settle for something that is close-ish to what you were looking for. The only fabric in the color you need is $20 per yard. When you take it to the cut counter the sales lady wants to make very sure that you understand the fabric is $20 a yard. And it is silk. You roll your eyes and use your 50% off coupon at the cash register, but waiting behind 20 people trying to throw together Halloween costumes did give you a lot of time to ponder if you really should be spending $13 on a last-minute piping detail on a jacket that is going downhill fast. a. 10pm. Because everything goes perfectly and you need to get your beauty rest. b. 11pm. You had a few snags, but things get done well enough in a timely manner. c. Midnight. You had some problems and spent a good deal of time with the seam ripper, but you finally feel you can stop for the night. d. 2am. You had a helluva time because your fabric is acting like a beeyatch, you can’t manage to do much of anything right, Burda instructions are crazy, and, oh yeah, you forgot you had to sew something else entirely for someone else for the next morning. Ooopsie. Of course, you work on your stuff first. But you get theirs done too. You finally get to go to bed. But by that time you are so wired you can’t sleep at all. a. Mozart. Because you are classy like that. c. Source Music: Jabba’s Baroque Recital. The fact that you know the name of such an obscure song offhand only proves that you really need to get some new music to listen to while you are sewing. d. Pink Floyd’s The Wall. One of the really depressing songs. It fits the mood of the sewing room really well. a. Are super excited because everything is going well and you can’t wait to finish so you can wear it! You power through and finish in a timely manner. b. Are fairly pleased with the way it is turning out, but are a bit tired and decide to stop for the night. c. Are kind of getting sick of this project. You can’t wait to move on to something else. Something fast and easy. Your next several projects are going to be knit tops. d. Are really sad because everything feels like it is going wrong. You are going to finish, but you don’t know if you are going to like it. The style is a bit more… 90s… than you were expecting. The seam lines looked great on the muslin but now don’t seem to be the most flattering, strictly speaking. You had to do a lot of last minute adjusting because your fabric is much stiffer than you expected, and so all your pre-emptive fit adjustments weren’t quite radical enough. You feel a bit bummed because your LOVE your lining fabric and feel like it might be a bit of a waste on this particular project. Too bad you already cut it out. a. Is from a high end designer’s collection. You only work with the most luxurious of materials. b. Is of decent quality. At least you are using all natural fibers, so everything presses well. c. Is aiming to misbehave. But you somehow manage to wrangle it into submission with a lot of steam and a stern eye. Well, mostly. d. Is not doing at all what you thought it would when you bought it. In fact, when you tested pressing it, it was acting just lovely, but in the actually garment? Oh, no. No, it gets all shiny and shows all of the iron marks. All of them. And how is it possible for cotton to leave this many fuzz balls? Your boogers are going to be the color of Cookie Monster for the next month. a. It is going to fit perfectly into your existing wardrobe. You can already think of at least 10 other pieces to wear it with. b. You realize that this might not work with everything you have, but you are trying to elevate your style, and this is a step in the right direction. c. You think this will get worn, but perhaps not as much as your originally intended. d. You realize you have spent so long in academia that you no longer know what passes as style in the real world. You think sitcom stars from the 90s would have loved your jacket, but no one in the real world today would ever wear such a thing. You start to doubt all of the projects you have been planning for a while now. You start to ponder if you have any taste at all. 35-40 Points: Congratulations! You are Mrs. Vogue of yore. You were born to sew and the gods favor you and your insanely magical talents. Every sewing blogger in existence is jealous of your mad skillz. You fit into everything right out of the envelope, you never need to make a muslin, and you are the most stylish woman and/or man in your zip code. 25-34 Points: Yay for you – you are having a pretty good sewing day! A few normal human bobbles, but all in all things are going your way. Better keep the momentum going while it lasts! 16-24 Points: You aren’t having the best sewing day. Everything is taking longer than normal, you are making silly mistakes, and just aren’t feeling the mojo. Maybe you should just leave things off until tomorrow. 0-15 Points: You are having a Sew Skate Read kind of a sewing day. Nothing is going right for you. Your project is disintegrating in front of your face. Nothing looks as good as you expected, all of your sewing has wonky glaring errors, and you can’t decide if it would be more painful to scrap the whole thing or just press on. Let me hand you a tissue. We can wipe our Cookie Monster boogers together. It's clear that you have been in my sewing room. How did you know? Troops, this has been going on for a decade. I now have two pairs of pants to repair, and I just saw the patch material a week ago. I put it someplace safe…where? no idea. LOL – yep – D is pretty much me. Oh dear! I was flying yesterday and horridly jet lagged today, so it's probably going to be a “d” all the way kind of day if I sew. Hang in there!